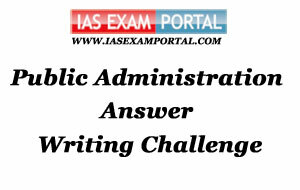 Weekly Mains Exam 2016 Answer Writing Challenge - Public Administration "MODULE- 42" | IAS EXAM PORTAL - India's Largest Community for UPSC Exam Aspirants. Weekly Mains Exam 2016 Answer Writing Challenge - Public Administration "MODULE- 42"
Public Administration- Paper I "Syllabus Topic - Organizations : Public Private Partnership"
Q1. Explain the impact of Privatization on Public Administration with special reference to Public- Private Partnership (10 Marks). Indian Administration- Paper II "Syllabus Topic – Philosophical and Constitutional framework of government : Bureaucracy and development." Historically it has been observed that bureaucracy antedates development administration and does not fit into the requirements of modernization. Conservation rather than change is the essence of Weberian bureaucracy. Indian bureaucracy has also been criticized as urban-oriented and elitist in nature and unrelated to the needs of rural areas where most of the people of the country live. Above all, development has been looked at as essentially a matter of shrewd political management of society. Bureaucracy , in this context has often been considered a threat to political leadership and an undesirable monopolize of power. It has even been suggested that developments calls for a degree of debureaucratization and steady institutionalization of political participation in the management of development.